About two weeks after a new baby is born, the family and friends get together in a small ceremony to give the new baby its name. 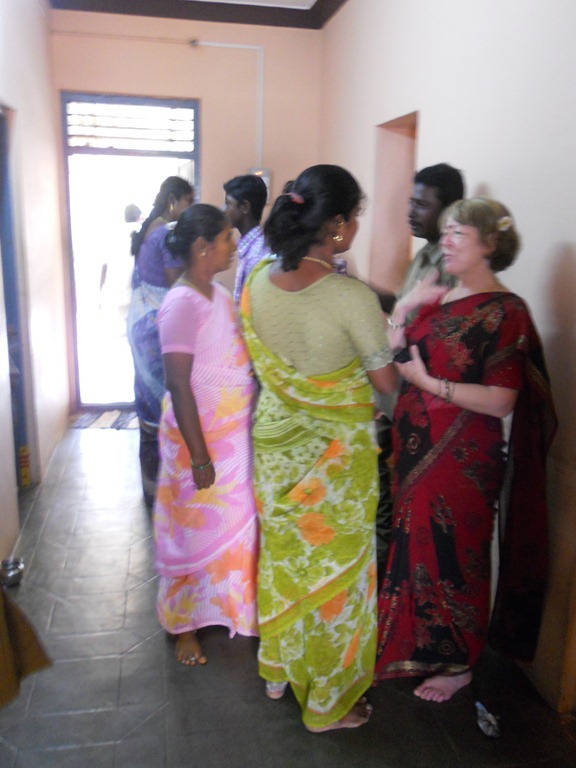 We posted the late pregnancy ceremony, The Tamil Bangle Ceremony – Valaikappu , a few weeks ago. A few motorcycles are parked outside Valen’s family house. Valen and Satya are the new dad and mom. They live in a joint household with Valen’s mother, father, and brother. 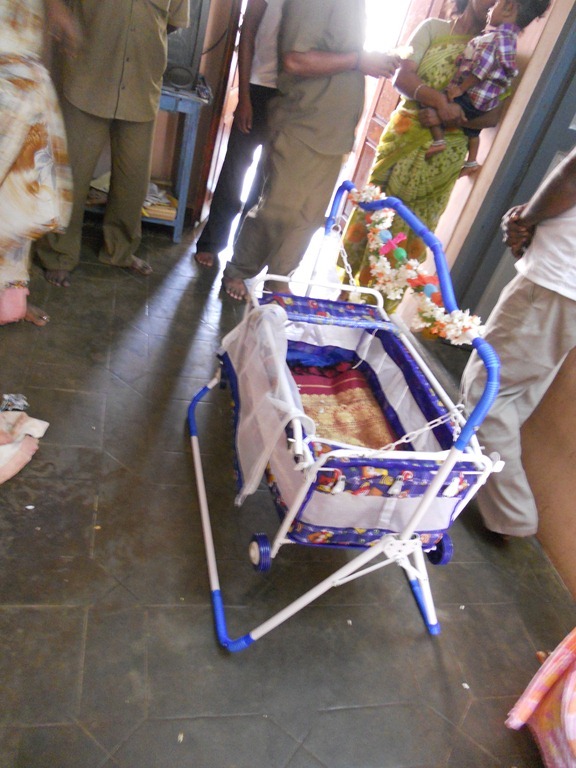 When we arrive the new baby was lying on a bed, surrounded by family members. 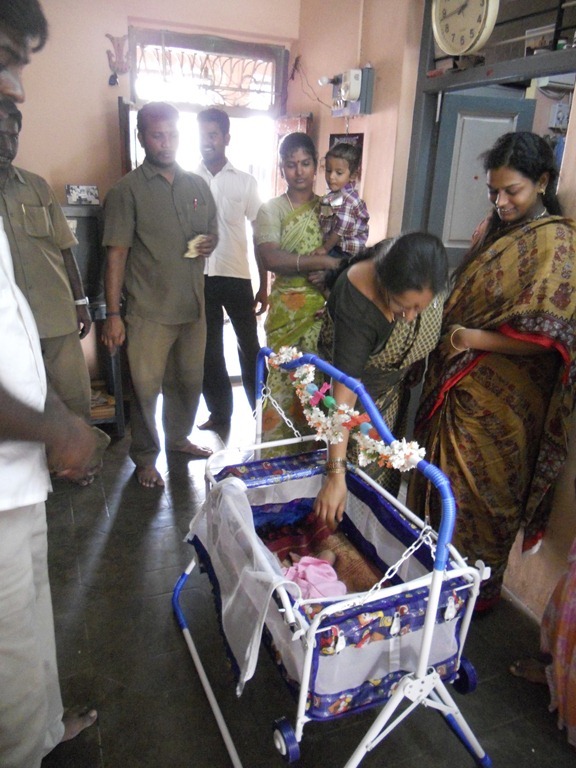 We were told that the baby’s name is Mithun Kumar. To name the new baby, they consulted an astrologer, and this was the auspicious name that he gave them. Mithun Kumar was dressed up in a traditional pavadai chattai (Tamil for “frock” and “top”). 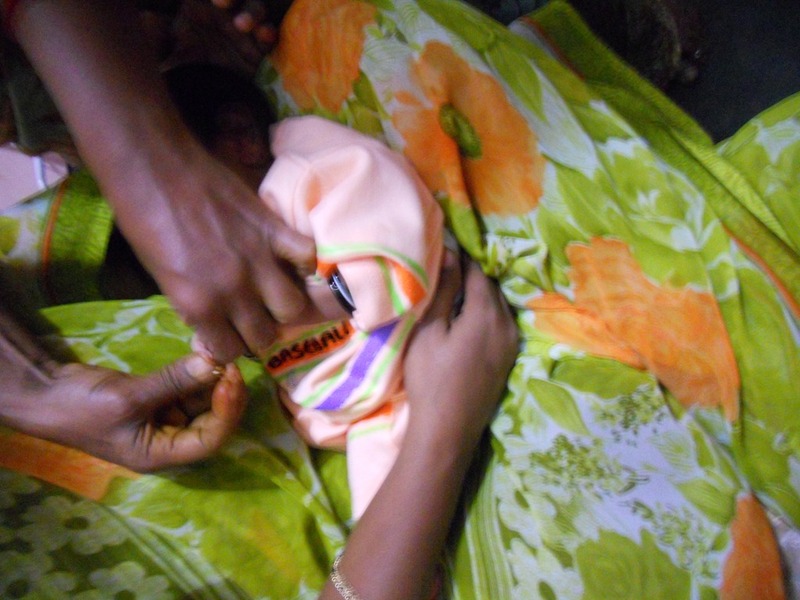 He will be dressed again for the naming ceremony. A number of people, mainly relatives, have come for today’s function. Since this is for a new baby, there are only a few people here, and it will be pretty short, only about one hour, brief by Tamil standards. Redressing Mithun Kumar for the Thottil. 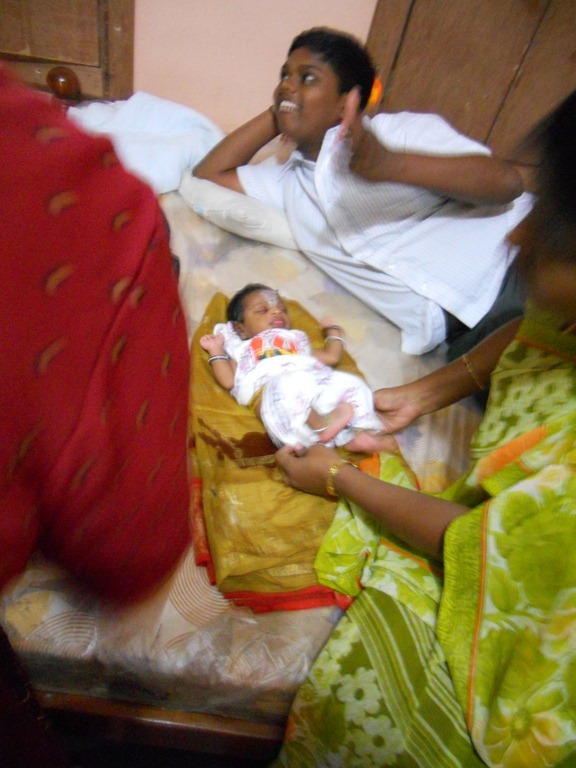 Mithun Kumar, held by one of his many aunties. Friends look on. 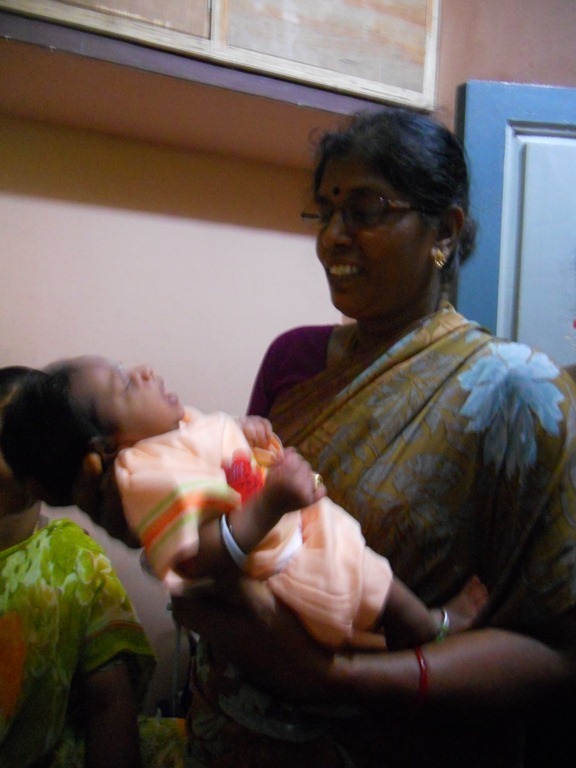 Janaki is holding another young child, Karuna’s son, who is quite interested in the new baby. 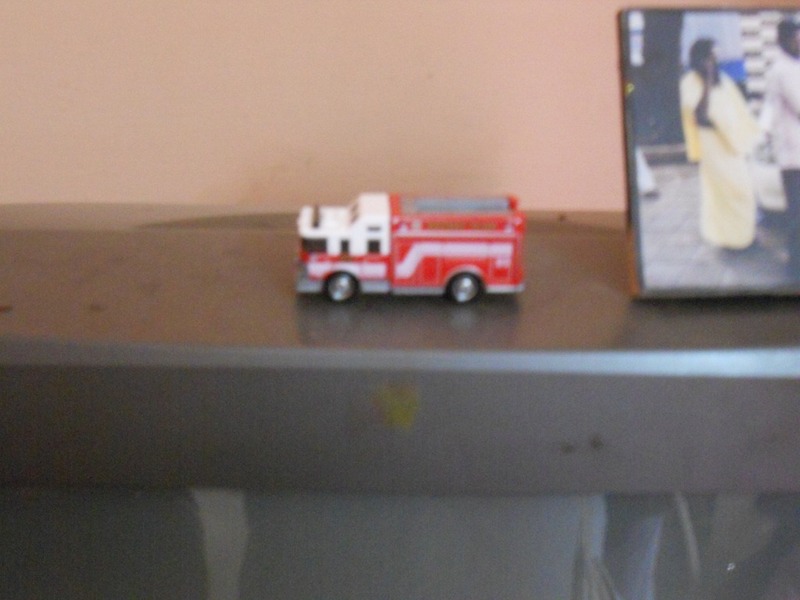 This is a Matchbox series fire truck. 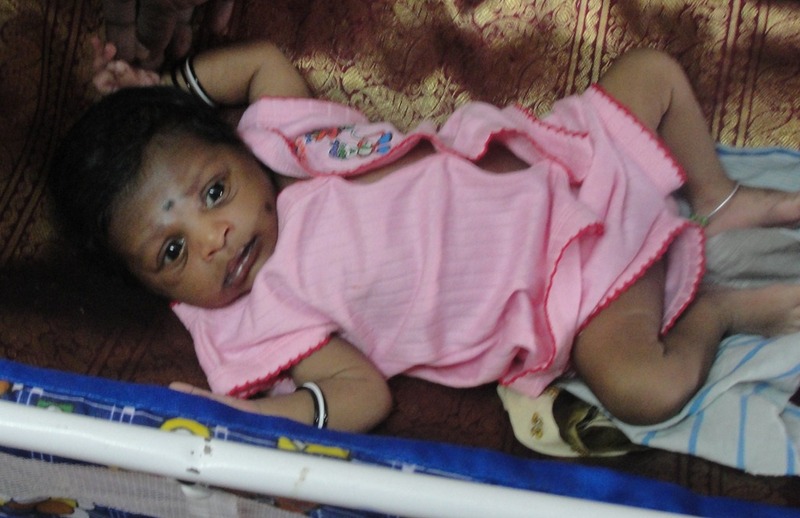 Valen bought it for Mithun Kumar shortly after the birth, on a trip with us to Pondicherry. Mithun Kumar being handled by the family. The women are quite happy to see and hold the new baby. I am not so sure that Mithun Kumar was as happy as they were. We sat down to eat. Usually the meal is after the ceremony, but today we eat first. I think this is to make the day a brief one to lessen the strain on the new baby and mother. 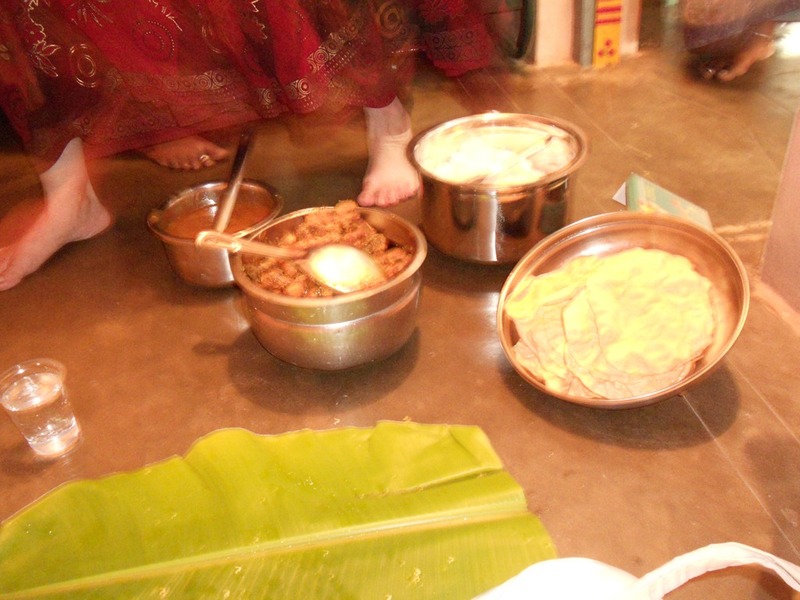 We are all eating sitting on the floor with banana-leaf plates, using our right hand, of course. 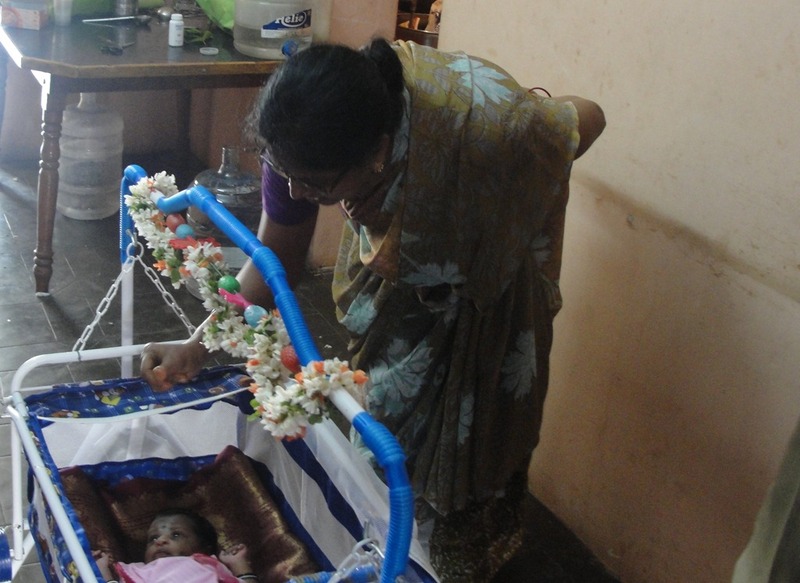 In the pooja room, gifts for the new baby are set out. Now the ceremony is about to begin. The thottil (baby carriage) is set out. Mithun Kumar is set into the thottil, wearing yet another different set of clothes. Now all those present come to him. Some snap fingers to get his attention. All say “Mithun Kumar” to him, three times. Mithun Kumar, making typical baby faces. The black dots on his cheek and forehead are to ward off the evil eye. Here is my balding head as I lean down to say his name. Here is the father, Valen. He is happy today. Practicing being a father by holding Karuna’s son. 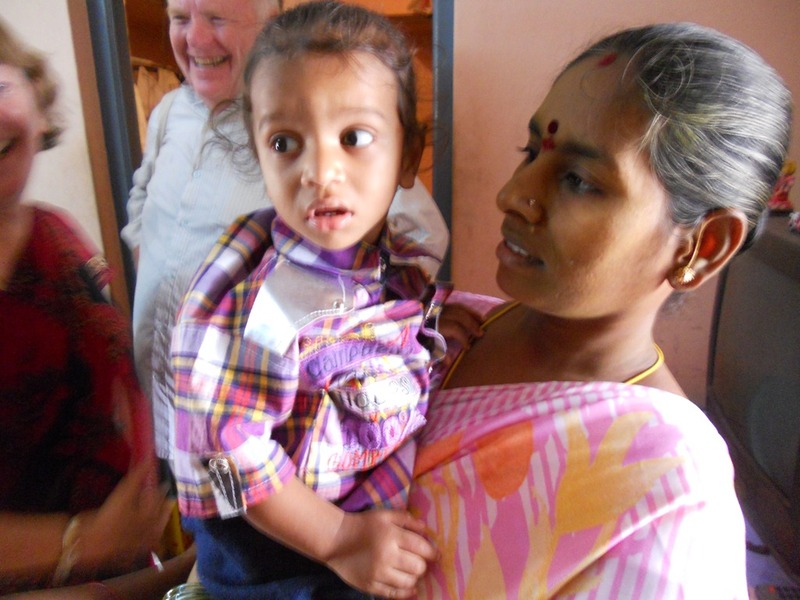 We were rushed out of the house at this point–it was enough for Mother and Baby. I read on the Internet more about the entire ceremony. There is a Brahmin version of the ceremony that is much more elaborate. Below is the prescription for the complete ceremony, (including many terms that I am not familiar with). turmeric powder 50 gram; coconut 5 nos; banana fruit 12 nos; betel 50 nos; betelnut 50 gram; paaku pottalam 20 nos; sandal wood powder 5 gram; kumkumam 5 gram; thodutha pushpam 2 metre. plantain leaf 4 nos; mango leaf bunches 8; brass sombu 1; raw rice 1 kilo; deepam 1; oil; thiri and match box for the deepam; tray and thaambaalam 4 ; bell; palagai 4; panchapathra uthirini 1; sugar 1 kilo; kalkandu 300 gram; paddy 2 kilo. 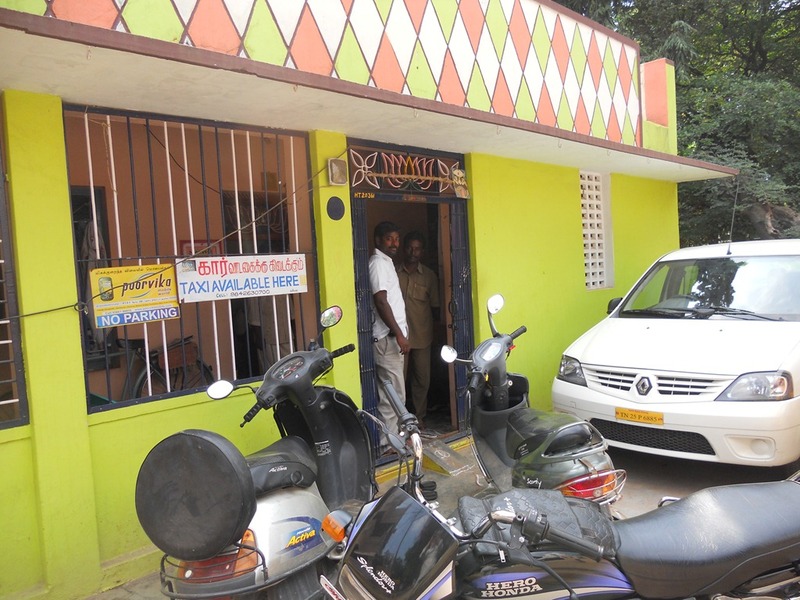 pancha kavyam 50 gram; honey 10 grams; ghee 200 grams; curd 100 grams; bricks 10 nos; vrati 6 nos; sraai thool 1 kilo. visiri 1. Maternal grandfather of the child should give dhoty; saree; cloth for child paruppu thengai and money with thaamboolam; fruits; chandanam, kumkumam, sugar and kalkandu to the child’s father. 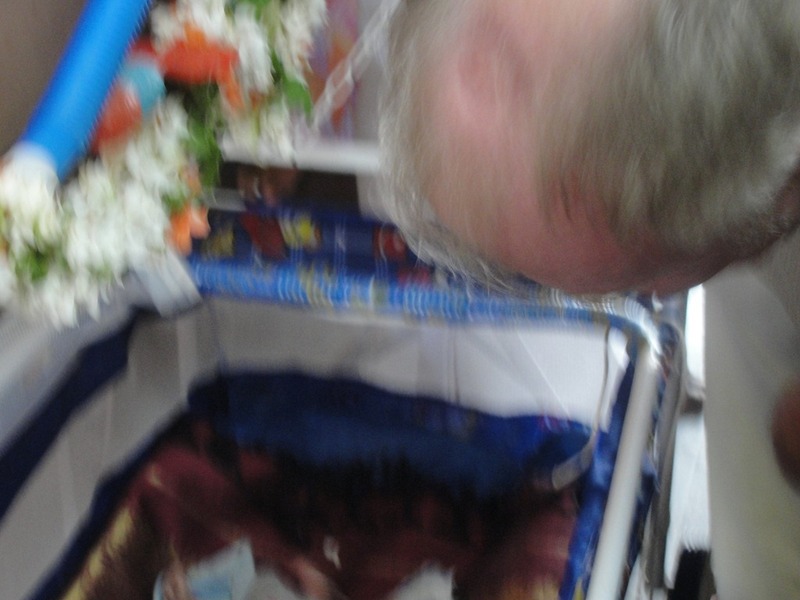 Paternal grandfather must give money with thaamboolam and fruits, chandanam, kumkumam. Paddy seed will be given to all males [and]females; young or old. Paddy and dhakshinai to sastrigals are the paternal grandfather’s expenses. Punyaha vachanam jatha karma and namakarnam will be done on the same day. Clean the floor and draw a kolam. Spread one kilo of paddy and over it put a plantain leaf and spread raw rice 1 kilo over it keep the brass sombu (one litre capacity) pour water in the sombu and place a coconut and mango leaf bunches and a koorcham on it. Decorate it with chandanam and kumkumam and with nool. 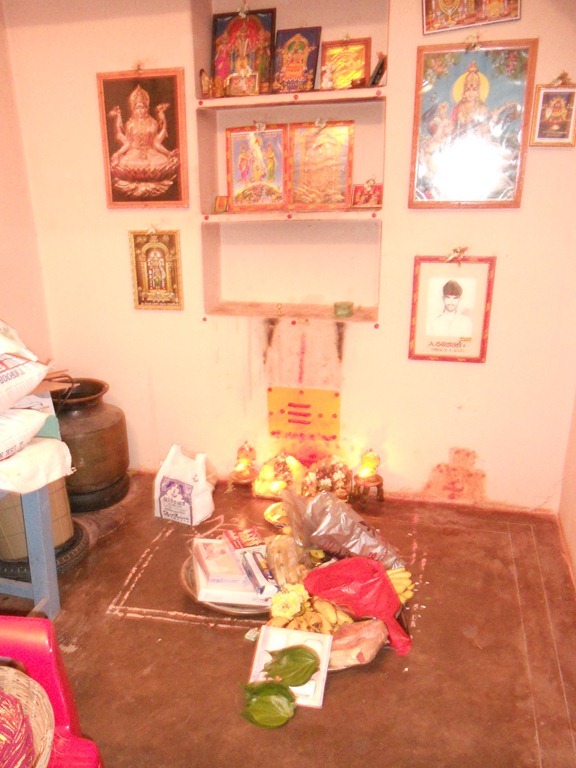 Sastrigals 4 numbers will chant pavamaana sooktham after aavaahanam of varuna devan, and upachara pooja. Then they will sprinkle this water all over the house, and all will take this water each one teaspoon full. Then sastrigals will say jatha karma mantrams and nandhi sratham will be done in simple manner . Then starts naamakaranam. 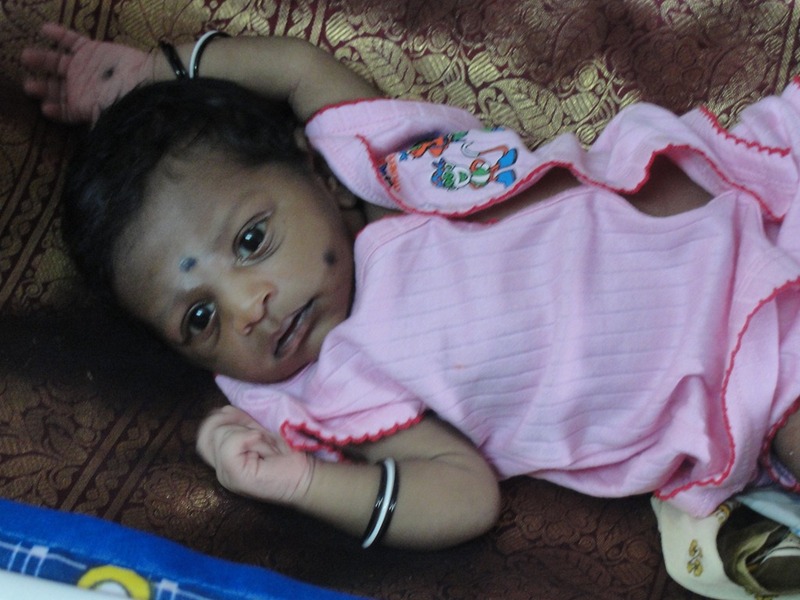 Peridal do sangalpam that you are going to name the child after saying the birth star and rasi. Do punyahachanam for this and do graha preethi dhanam. 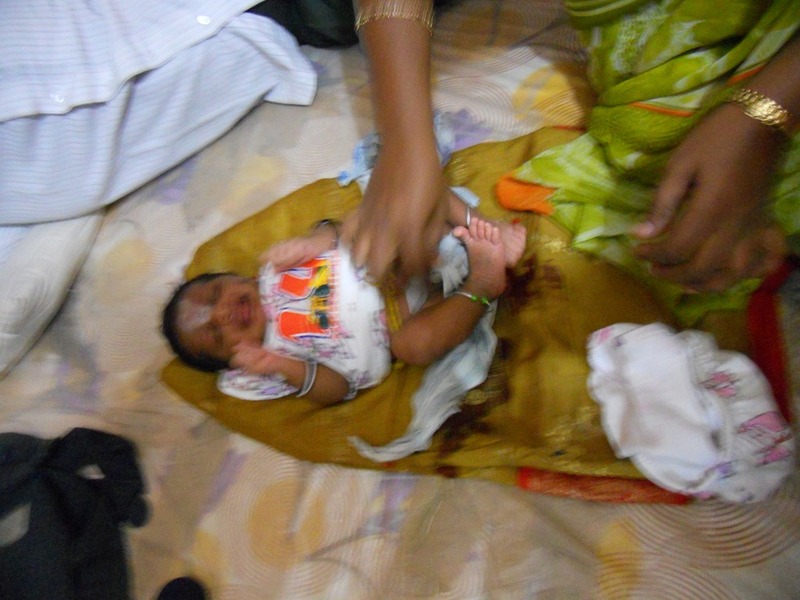 On the same day evening or night in an auspicious time the child will be placed on a thotil. 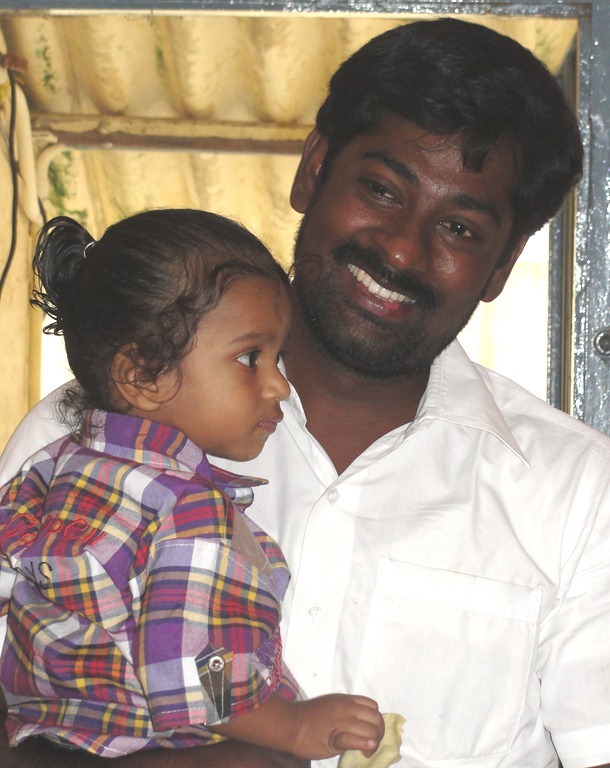 Below this thotil spread some paddy and write the name of the child. 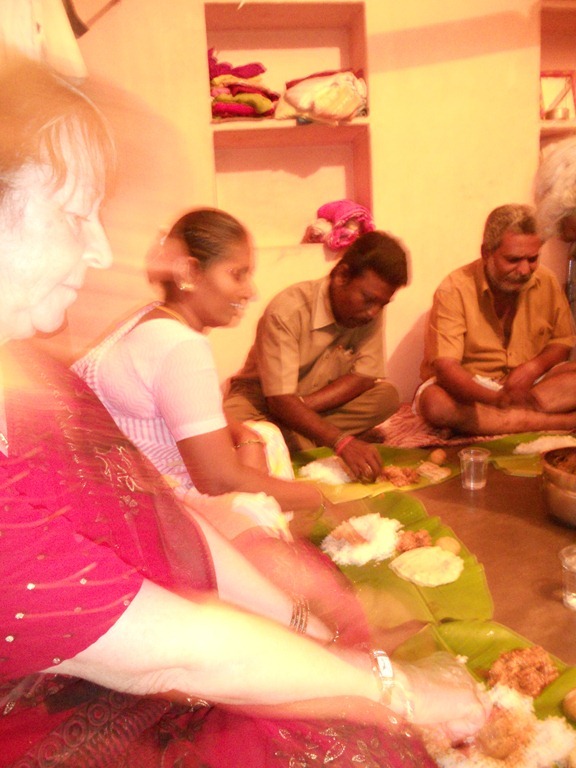 Child’s father’s sister (athai) will do the kappiduthal. Gold bangle 4 nos. are called kaapu. Also along with this gold chain in the hip of the child (araighan kairu) will be tied along with thaaithu and naakaasu etc; which is available in jewelry shop. 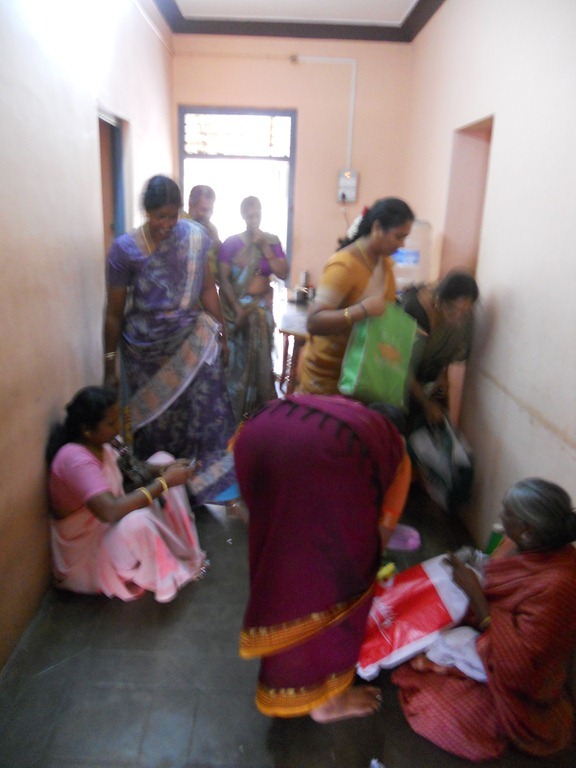 Kaaparisi and kattipruppu will be given to all and the ladies will sing songs and they will be supplied with gifts: manjal; kumkumam; thaamboolam and chandanam and blouse bits and dhakshinai. Aarathi will be taken. What we participated in today was a simple ceremony compared to the complex ritual described for Tamil Brahmins. 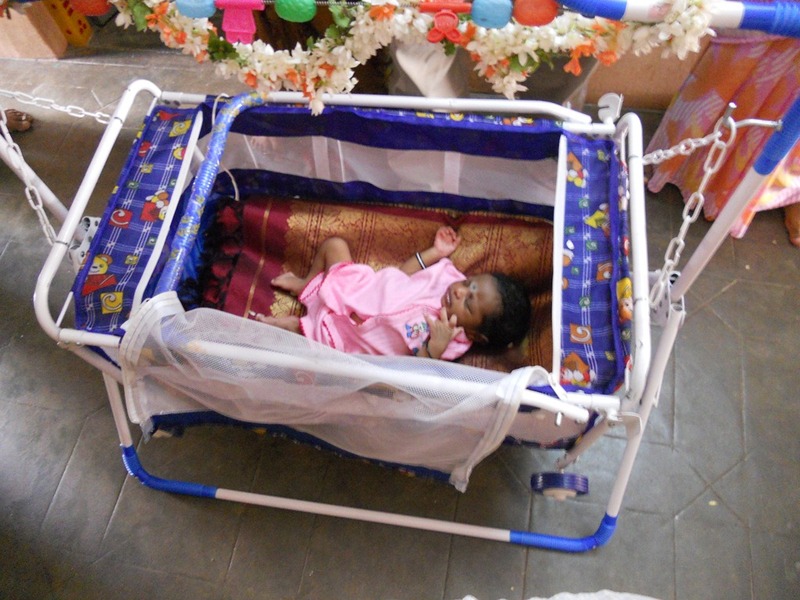 We were so pleased to join in this celebration filled with the love of family, welcoming Mithun Kumar into the world . 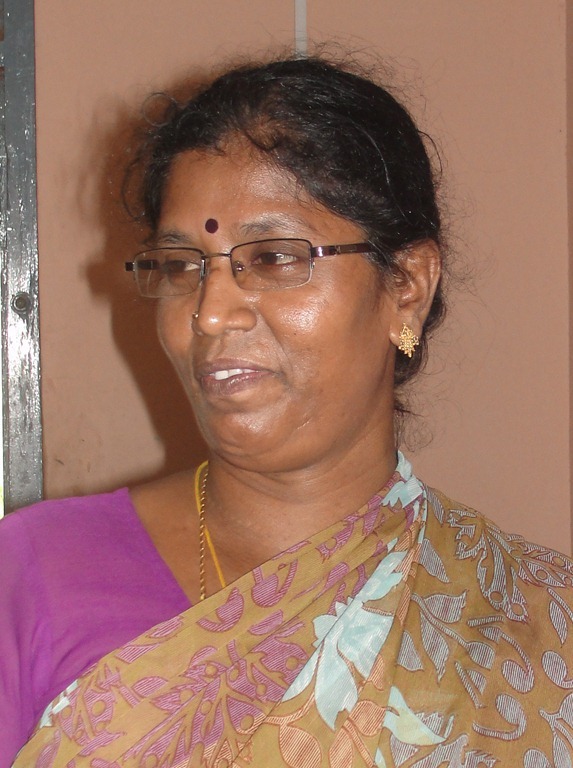 This entry was posted on January 12, 2012 at 5:18 am and is filed under Festivals, Celebrations and Rites, Life in South India, Tamil Women, Tiruvannamalai, Village life. You can follow any responses to this entry through the RSS 2.0 feed. You can leave a response, or trackback from your own site.